I’ve had a multi-cat household for more than forty years. Here are the six I have at present. 1. Hasenpfeffer – is a short-haired white cat with grey markings on his head, a grey tail, and a big, grey “thumbprint” on one side, born approximately Aug. 27, 2002. 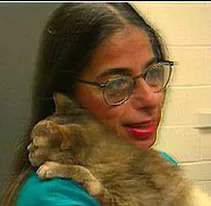 In October, 2002, when I was working at an animal hospital in Fairlawn, New Jersey, one of the receptionists brought in a tiny kitten whom she’d found in the courtyard of her apartment complex. He was flea-ridden and had ear mites, but was otherwise healthy. She had noticed him and his littermate hanging around for several days, but couldn’t catch the littermate. I was rather low on cats at the time, and although I normally don’t adopt kittens (I adopt adult cats, preferably older ones who have problems that no one else wants to deal with), I decided to take the kitten home (after giving him a flea bath and starting him on ear mite treatment). He was a robust fellow, very stocky, even at the tender age of approximately five weeks. He grew up to be a very stocky cat and weighs in at nineteen pounds, perhaps two or three pounds overweight. He’s not a huge cat, just extremely muscular. He’s a very nice boy with a controlled dominant personality. When I bring in a new cat, he tends to stare them down, which bothers the new one, but he never hisses or starts fights, he just wants to get to know the new one, while letting the new one know he’s Top Cat. He’s the only one who cares about establishing rank. There used to be a company in Monroe, NY, called Cats, Cats, and More Cats that sold cat stuff for people (shirts, mugs, jewelry, etc.). A few times a year they’d send out a catalog which included a letter from an adorable kitten named Hasenpfeffer, the Chairman of the Board. This kitten looked just like him and that’s how he got his name. I found out later it means “rabbit stew” in German, which bothered me, but I liked the sound of the word, so I kept it, and, by the time I found that out, he had learned his name. 2. Foofie – is a grey short-haired cat, born approximately Sept. 4, 2002. Right after I adopted Hasenpfeffer, a close friend told me that at the animal shelter where her daughter worked, there was another little boy kitten, close in age to Hasie. He’d been found in a woodpile near New Paltz, very small and all alone. I went to the shelter with my friend and tested the little kitten for feline leukemia and feline AIDS, as I always do before bringing a new cat into my house. I brought Hasie with me so he could meet his new brother. The kitten tested negative for both viruses, so I put him in the carrier with Hasie and took him home. My friend suggested I name him Pfefferneuse, which means “pepper nuts” in German. I said okay, but I didn’t love the sound of the word the way I loved the sound of the word hasenpfeffer. The two kittens became inseparable right from the beginning. I started calling them The Foofies, which led to my distinguishing the two Foofies as Foofie the Elder (Hasenpfeffer) and Foofie the Younger (as they were approximately a week apart in age). I never did end up calling the younger one Pfefferneuse. He became simply, Foofie. That’s what I call him. He nursed on my arm a lot for the first couple of years, but finally gave it up. He still likes to make biscuits. He’s a very affectionate cat who just loves to make friends with everybody. He’s a wonderful soul! 3. Pancho – is a grey short-haired cat with a stump of a tail, which he wiggles a lot. It’s very cute. I estimate he was born in the Summer of 2007. I noticed him at my mechanic’s garage in the Summer of 2008 and discovered he was very friendly, with a bit of a wild streak. My mechanic told me he’d been hanging around for months and seemed to be asking to come in. He’d spend the whole day there, every day. My mechanic wasn’t feeding him, except for a little bit of his own lunch now and again. I examined him, vaccinated him, dewormed him, and brought over some cat food and two bowls. Then I started to do some detective work, as it was starting to get cold. I went over there late at night and very early in the morning. He was always there, sleeping on the blankets my mechanic left out for him. One Sunday, I knocked on a few doors on the street and found someone who’d been feeding him outdoors for a few months. He said his next-door neighbor would also leave food out, that she feeds the neighborhood cats. The man told me that this cat would play rough with his own cat, who he let out. He didn’t believe the cat had a home and he’d never given him a name. One of the men working for my mechanic had named him Pancho. (My mechanic and the men working for him are all from Ecuador.) Although they all liked him a lot, none of them intended to adopt him. I just couldn’t leave him out in the cold, so now he’s one of my gang. He was on the defensive for 2-1/2 years, and wouldn’t let me near him, but he did settle in, spending most of his time in one of the comfy cat beds and didn’t seem to miss going out at all. He’d been looking for a home. That was very clear. Soon after I adopted him, I was told by the man who’d been feeding him that he’d found out Pancho had come from a restaurant up the street. When the place got sold, Pancho got left behind. So, finally I knew where he’d come from. In the Spring of 2011, virtually overnight, he decided he could trust me and started following me around like a dog. All he wants is love! I had to teach him to not bite and scratch me from excitement. He learned in approximately one month. He’s always by my side now and gets along just fine with my other kitties. Oh, and now he thinks it’s a lot of fun to run out the door ahead of me, but he doesn’t go anywhere. He wants to sniff the grass a bit and follow me around. He just rolls over on his back, stretches, and waits for me to pick him up and carry him back inside. He’s a wonderful, wonderful boy! 4. Billy – is a short-haired black and white (‘tuxedo’) cat who I rescued as a stray outside a friend’s house in Staten Island in the Fall of 2009. I estimate he was born in 2007 or 2008. He appeared to have a bum right front leg, as he held it up, refusing to put weight on it. After I brought him home, he no longer held the leg up and used it normally. I have to wonder, as the change was so dramatic, if he held the leg up deliberately, figuring he’d be rescued if he appeared three-legged lame! Friends have told me of other cats who did the same thing and my cat Buttercup, r.i.p., did it too. Billy is one of the nicest cats I’ve ever had. He loves to have his belly rubbed and purrs very loudly. He also talks a lot, as much as a Siamese. He’s quite an amazing soul. 5. Seraphina – is a short-haired tortoiseshell cat with an orange blaze all down her nose, born approximately June 13, 2011. She’s named for her blaze – seraphina means fiery in Hebrew. She was found outdoors with her littermates on August 13, 2011, when she was only two months old. The rest of the litter ran away, but she didn’t run because she couldn’t see. Her eyes were all shriveled up. She was brought to a shelter, where another veterinarian immediately took her home to foster her. The veterinarian enucleated (removed) Seraphina’s eyes two months later, on October 12, 2011, when she was big enough to be anesthetized. I adopted her as a 4-1/2-month-old kitten on October 27, 2011. I had been wanting another blind kitty ever since I adopted Tina, an old, blind cat many years ago, whom I found truly fascinating. Seraphina climbs up and down everywhere and loves to play in the grass and leaves and does broad jumps in them! She practically does somersaults on her Turbo Scratcher (the BEST cat toy ever! ), lies down on her back in front of it, reaches up over her head with her front legs, and bats that ball around and around and around. It’s really funny! She’s very calm and fearless…and very, very bright! She’s one of the very most affectionate cats I’ve ever had and if you didn’t know she can’t see, you’d never guess! 6. Kerach – is a short-haired tuxedo cat, more white than black, born approximately June 30, 2011. Kerach (pronounced “keera”) means ice in Hebrew. She was found outdoors and brought to the same shelter as Seraphina on August 30, 2011, when she was two months old. Her eyes looked like there were advanced cataracts. The same vet who fostered Seraphina took Kerach home as well, where the two kittens quickly became best buds. Kerach had another problem in addition to her eyes. She didn’t grow! In fact, she didn’t do anything! By the time she was four months old, she still fit in the palm of your hand – she was the size of a one-month-old. She didn’t even eat on her own! She didn’t play or respond to human stimulation. This is called “failure to thrive” and always carries a poor prognosis. By the time she was 6-1/2 months old, and weighing in at two pounds, the vet felt that she would survive and I adopted her on December 15, 2011. During the first week she was with me all she did was eat, drink, use her litter box, and sleep. She did not play. She did not relate. Then, all of a sudden, Sleeping Beauty woke up! She began to play with Seraphina! They would wrastle and little Kerach was the aggressor! Over the next few months she started growing nicely and started purring and relating to being held and petted. And she takes things – anything she can (or thinks she can) carry in her little mouth. She’s tried to walk off with my sleeve – when my arm is in it! When I’m preparing food, Kerach’s right in the middle of whatever I’m doing! The world truly is her oyster! Convinced that Kerach does have some degree of vision, I took her to a veterinary ophthalmologist, who ultrasounded her eyes and demonstrated that while the fronts of her eyes did not develop properly, some light gets through and is processed correctly through the backs of her eyes. She’s quite substantial now. She’s a small-ish cat, having gotten off to a very slow start, but she’s not a midget. She’s perfectly healthy and completely normal in all respects! I’m SO lucky to have my very special kitties Seraphina and Kerach!